This week the American Astronomical Society (AAS) is having their biannual meeting. You can follow along with tons of great tweets from many astronomers at the meeting by following #aas222. Full version of the word cloud is here! This visualization is a little silly, but it does give you a sense for what people are talking about this week. Lots of big name telescopes can be found in the 'cloud (like Kepler and Hubble), and abbreviations for the states that are home to many of astronomers (AZ, CA, MA). I'm happy to see "stars" as one of the biggest science words, and cool to see WIYN getting lots of love (which makes sense given the meeting's location, and ODI being online). I made one of these word clouds for AAS 221 as well, though I might have pre-whitened it by removing (e.g.) United, States, and University. I can't recall. Comparing these two word clouds, however, has given me an idea I'd like to pursue: using the word frequency of paper (or meeting) abstracts to track the popularity of astronomical topics/sub-disciplines over time. Full version of this cloud is here! 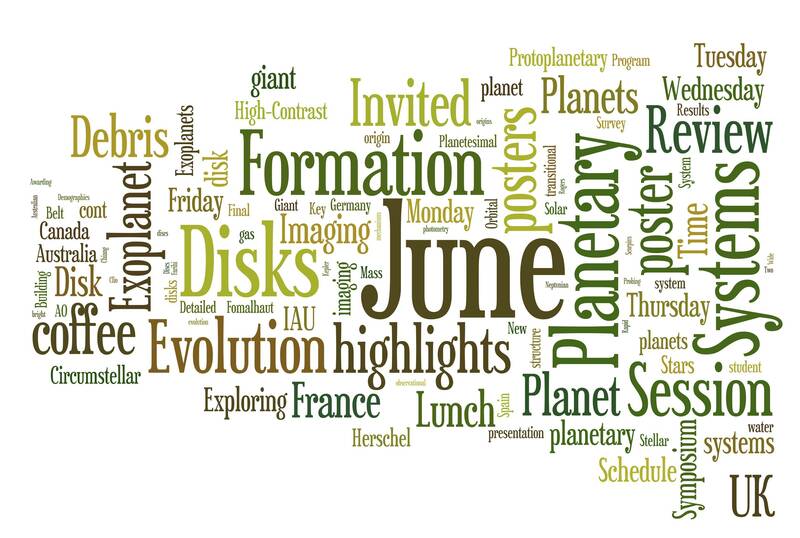 I realized as soon as I hit publish that the IAU Symposium #299 is going on at the same time as AAS 222, which is one reason there are so few uses of "planet" in the original word cloud. Here for comparison is the word cloud generated from the IAUS299 meeting program. Here's where all those planet folks are hiding this week!